Written on September 29, 2010 by Kevin. 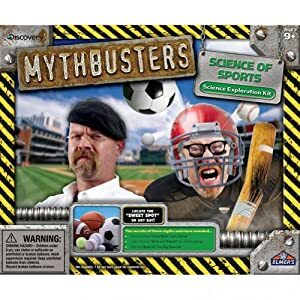 Welcome the "Mythbusters" activity kits, which offer trial and error hands-on learning. These kits are made by the popular Discovery Channel's top show. Each kit has several myths to "bust" regarding the specific title. I received the Science of Sports kit from Teammom in the mail recently and was immediately became excited. This kit, along with the others, will provide lots of variables to test the myth. This will be a perfect addition to the science books my wife will teach during homeschooling. This kit really does seem to include everything necessary to have hours of fun and learning. Their other kits include Force of Flight Science, Power of Air Pressure Science and Weird World of Water Science. Simply speaking, I would have loved these types of science kits when I was younger. I am happy to be able to offer these kits to the kids so they can learn with the benefits of hands-on and not just talking about something. While this toy is rated for older children, we will certainly get use out of it in a few years. These kits are available nationwide at Toys 'R' Us and specialty toy stores such as Learning Express. The age range is 9+ and they retail for around $20. With the holiday season quickly approaching, this may make a great addition. You can find additional information about all of the kits on GiddyUp.com.